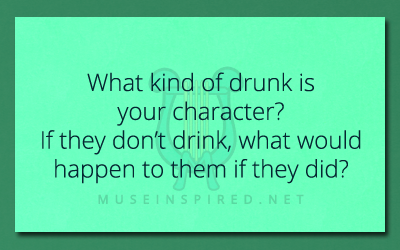 Character Development – What kind of drunk is your character? What are their opinions on alcohol itself? What about other people drinking alcohol? Have they ever had alcohol? Do they drink occasionally, or often? With friends? Alone? Are they an alcoholic or a recovering alcoholic? Are they susceptible to becoming one? Why do they drink, or what situations WOULD they drink in? Can they handle their alcohol? How much alcohol does it take to get them tipsy? Turbo drunk? Blackout drunk? When they are intoxicated, what sort of behavior do they have? Do they get giggly? Horny? Angry? Sad? How do they respond to their friends and loved ones when they get drunk? How do they respond to enemies? Does this character have awareness about how drunk they are and try not to behave all drunk? Or are they oblivious and lost all inhibitions and control of themselves? Do they get really bad hangovers or are they able to shake it off easy? After one hell of a drinking binge, are they likely to drink again? Character Development - What's the weirdest food your character has ever eaten?